When looking for the best spinning reel you want something that will compliment your fishing rod so trying to find the best spinning reel can be very challenging. You want something that offers value for money, that is built to last with good bearings and doesn't weigh too much so it will be nicely balanced on your fishing rod. When looking to buy a fishing reel you have a few considerations to think about. First of all, the price of the reel is normally the top priority. Most of the best spinning reels in our review are under 100. However other things to consider may include the weight of the reel. You should aim to have the rod and reel nicely balanced. Furthermore, you have the gear ratio which is how many turns it takes to reel the line back on the spool. The number of bearings the reel has, so the fishing reel has a nice smooth action when playing the fish and the reel doesn't suffer from spool wobble. Also what the body of the reel is made from needs to be known so it will be able to withstand harsh conditions like sea fishing. When looking for a new reel the weight is a consideration. Hence, something that is well balanced with the rod you are using is recommended. This is because when casting it compliments the cast and doesn't fight against you. The drag system is an important part of any reel when looking for the best spinning reel, as it allows you to put as much or as little pressure on the fish when playing it. If the fish wants to run then you can allow it to do and you don't then suffer the dreaded hook pull. Aim for a reel that has a nice smooth drag system. The gear ratio of the best spinning reel determines how many rotations of the reel handle it takes to reel the line back on the spool and the speed of the bail arm as it rotates around the fixed spool. Therefore, a 5.6.1 ratio would mean the bail arm would rotate around the spool 5.6 time per 1 rotation of the reel handle. As a result, the higher the ratio the faster the retrieve of the bait. Another important factor is the housing of the spinning reel which can be made from a few different types of material. Aluminum is nice and light. Light is great for freshwater fishing however it wouldn't stand up to seawater as the salt would corrode the aluminum. Graphite reels are not affected by saltwater so are a better option for sea fishing. This then allows the reel to stand up to the more harsh conditions. This Penn II battle reel is suited to big saltwater gamefish with the casting range and power it offers. It features full ruggedness with the metal construction including the heavy-duty aluminum bail arm wire. The cranking power of this reel will help you land your catch. The drag system uses carbon fiber washers to give a nice smooth clutch for when you need to let your catch take some line. It is therefore powerful enough to stop them when needed. With 5 sealed main stainless ball bearings it gives this fishing reel a very nice smooth reeling action, and an anti-reverse bearing to give you a nice smooth reverse winding when needed. In addition, another nice feature is the spool had a rubber base that allows you to use braid without worrying about it slipping on the spool. This Okuma reel is a well-designed contender with its smooth action. This is because of the 8 fluid bearing system to give the elliptical gearing the best support for longevity in all conditions. Furthermore, the solid heavy duty bail arm wire with oversized roller makes for a nice smooth and even line lay. This is without worrying about getting any tangles with the heavy duty roller you can be confident that it will handle braid. The rotor system is designed with Okuma RESII computer balancing which allows it to spin at a high speed without worrying about any spool wobble. With a stylish well-designed handle that is forged from aluminum. Therefore this keeps the weight of the reel down and the EVA handle makes sure it's nice and comfortable for when you're cranking over the reel. Size options go from the C10 for small freshwater specimens, right up to the C65 for river monsters. As a result, both reels can take the punishment and deliver the cranking power. The Daiwa popular BG series of reels are now a bit leaner with the ultralight series for small freshwater fishing. However, you can purchase right up to the 800 heavy duty saltwater big game models. With the braid ready light aluminum spool, you do not have to worry about the braid slipping. Also, you won't need to use backing line on the spool with the tough roller makes it a nice to have feature. They have a big gear, tough threaded handle that is well designed for comfortable use. 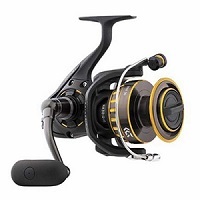 With the genuine stainless NMB bearings, all metal body and rotor, with a very smooth drag system makes the BG series of reels very good value for money. In conclusion, with the various size options, you will find the right reel to compliment any rod, from the 1500 size right up to the larger 800. The newly designed Stradic reel sees Shimano's more traditional, but perfected technology has been used. By using Hagane cold forged drive gear along with XShip, this reel is very smooth. Shimano's high-quality components also ensure this reel is extremely durable. Fatigue is reduced via its efficient weight balance from the G-Free body. This reel provides the high quality we expect from Shimano. Hagane gearing is exclusive to Shimano and reflects the newest advances in reel technology. Shimano is world renowned for their high-end gearing and the Hagane gearing takes it to a whole new level. This is a cold-forged aluminum drive which is built to last. This reel will take whatever you throw at it. Durability and power are most definitely the selling points. The Hagane body provides the same level of durability as seen with the gearing. Body flexing is not an issue with this high-quality metal body. This allows you to benefit from full cranking strength. The X-SHIP system works in tandem with the gearing to reduce twist and rotor flex. The result is effectively smooth cranking which ensures even tension is maintained between you and the fish. This is the second Penn reel in our best spinning reel review. It's no surprise that it is a durable construction which makes it a durable reel. With the lightweight graphite body which also makes it corrosion resistant to the harsh conditions and when sea fishing which is a real test of a reels durability. The 4 shielded stainless ball bearings give this reel a nice smooth action for when you're hooked on your capture. The instant anti-reverse removes even the slightest rotor back play so you're in full control. with the oiled felt drag offering nice smooth control, to allow you to play the fish with the right amount of resistance. With many size option available from the 3000 right up to the 8000, there is a good choice to match up the perfect reel for your set up and the type of fishing you will be doing. Anglers insist on good quality and getting what they pay for. It does seem that this reel does not disappoint. With nine stainless steel bearings, with the addition of an anti-reverse bearing, this reel is durable and smooth. You also gain improved crank control with the anti-reverse bearing. The durability comes from the aircraft grade aluminum handle along with the graphite body and rotor. The Pflueger President reel has a multi drag system made from a mix of stainless steel and felt washers which provides a very powerful reel. This reel is of graphite construction which means it is rigid and won't flex. This means it will cope with a fair amount of pressure without giving up on you. This reel is extremely reliable. This 2nd model of the Sharky reel has produced a stronger and more efficient reel. It comes with a higher line capacity which is an improvement compared to the original reel. This reel boasts features which allow both freshwater and saltwater surf fishing. The Sharky has triple disk carbon-fiber drag, is corrosion resistant and has anti-reverse. This reel boasts 11 bearings (one bearing being the anti-reverse) with mesh brass gears. It is available in seven different sizes which allows you to choose the exact reel for your style of fishing. Please be aware that for saltwater surf fishing that only the 6000 and above are recommended. The Okuma Avenger "ABF" bait-feeder fishing reel offers a tournament grade reel which incorporates Okuma's unique live line bait feeding system. It has six bearings which provide a level of smooth action. This is one reel from the Avenger ABF range that offers good quality and durable products. The unique bait feeding system allows the line to run freely with a rear adjustment. This allows the fish to initially run once it has picked up your bait. Once you lift your rod and re-engage the front drag you can then keep the tension on the line to play your fish as normal. The benefit of this is that the fish is not spooked by feeling any initial tension from the line. The Okuma Trio spinning reel is packed with features that make this reel one for consideration. It also boasts use for both freshwater and saltwater surf fishing which shows its versatility. The aluminum and graphite body incorporates 10 bearings which provide a very smooth drag. The result of this is that this causes less friction on casting which allows you to place your bait and hook more accurately. This reel is quite light but strong which reduces any flex when the line is under pressure. In addition, it is extremely durable. The Mitchell branding is world renowned and has many years of expertise that are applied to their reels. You know you are getting a very good quality reel with the Mitchell name. An extremely strong reel with its polymeric body and rotor. This Mitchell reel offers the unique bail 'halo' which avoids the bail arm making contact with the spool. This also stops the line going under the spool. An eight bearing reel with an anti-reverse mechanism. In addition, this reel also has a multi-disk drag system which allows smooth pressure whether you have caught a small or large fish. I hope this best spinning reel review has helped you decide and pick the right fishing reel.